What you see above didn't happen in Stearns Park. It's our digital composite comment on what was -- fortunately -- prevented by the activism of Traci Wilson-Kleekamp (who went on to form the Stearns Park Neighborhood Association), backed by Los Altos realtor Joe Sopo and LB park activist Ann Cantrell. 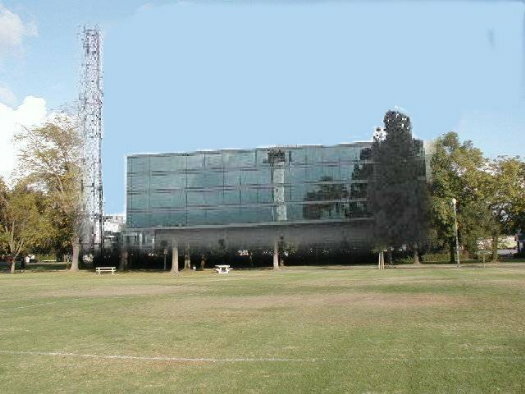 In late summer 1999, City Hall was proceeding with plans to build a massive Emergency Communications and Operations Center (ECOC) with roughly half on Stearns Park land and the other half on the adjacent LBFD training center. Ms. Wilson-Kleekamp and her husband had just bought a home in the area...and alerted and organized the neighborhood to what was planned. A firestorm of opposition to the Stearns Park site followed. LBReport.com's first guest editorial by Ann Cantrell decried use of park land for non-recreational uses. After then-Fourth district Councilman Del Roosevelt sided with the activists, the City Council directed city staff to find another location (which it did at Spring/Redondo). This preserved Stearns Park intact...and 5th district Councilwoman Jackie Kell has publicly credited residents who objected to the Stearns Park site with helping produce a better ECOC. City Hall used the relocation to update and upgrade its plans, producing what Councilwoman Kell has called "the most technologically advanced ECOC of any city in the country." Our digital editorial cartoon is not to scale and isn't a blueprint-precise rendering. Among other things, the radio tower and ECOC bldg. on Spring St. are in slightly different directions than the proposed Stearns Park layout.